Smoothie Factory Franchise Opportunity. It's a fast-paced, mobile world out there! People are on the go, and multitasking every step of the way. At the same time, people are more nutrition-conscious than ever. Instead of automatically opting for a fast-food burger, they're looking for healthier options - and they're finding the perfect solution at Smoothie Factory! 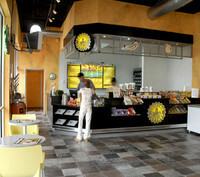 A unique concept in the health food industry, Smoothie Factory's blend of delicious-and-nutritious smoothies, nutritional products, great prices, and friendly service is attracting customers of all ages and bringing them back again and again! An innovative leader with a proven business model, Smoothie Factory, Inc. is a great franchise opportunity in today's growing $2 billion juice and smoothie bar industry. Co-founded by Olympian James Villasana and businessman Paul Scarlett, Smoothie Factory is a company that understands the need for a healthier alternative to traditional fast food, and it is satisfying the growing craze. From our beginnings in 1996, our focus has always been on providing quality smoothies and low-priced nutritional supplements in an inviting, upscale atmosphere. And it's a focus that works! From a single store in the Dallas suburb of Carrollton, Smoothie Factory has grown across the United States, with each location supporting our reputation for excellence in product, service, and value. Smoothie Factory's consistent track record of growth and success is the result of a better product, offered through owner-operated stores that benefit from the company's belief in building and maintaining a rock-solid brand. Smoothie Factory's most impressive trait, perhaps, is its desire to continually enhance its franchising system, interior design, and image. The result has been a solid, unbroken track record of success, and a company poised for rapid expansion - an unparalleled blend of vision, product offerings, and a franchise opportunity that's just right for forward-thinking entrepreneurs. Smoothie Factory blends good health with great taste in a product that's low in calories, high in nutritional content, and made with real fruit. Our wide variety of recipes is guaranteed to satisfy the flavor preferences of virtually every customer. Plus, we sell a wide selection of brand-name nutritional products for less, every day, at 30% to 50% off MSRP! Smoothie Factory aggressively finds the lowest price on all items without sacrificing quality or customer appeal, and our Owner/Operators are free to buy identical items through outside vendors if they find better pricing. Our commitment to value combined with our large inventory and price-point difference attracts a large customer base beyond our devoted smoothie aficionados, and has made us a leader in nutritional product sales. At the same time, these items help to expand our customer base and fuel impulse purchases of our high-margin smoothies. This dual strategy gives you an added advantage - and a greater chance to attract and satisfy more customers. Smoothie Factory Owner/Operators have always played a major role in the company's ongoing success - and our Owner/Operators' success is due, in large part, to the training we provide from day one. We offer each Owner/Operator a one-week training program at our headquarters and on-site assistance during the opening of each Smoothie Factory store. Our hands-on training is augmented by the materials you'll need to launch and operate a successful Smoothie Factory franchise, including comprehensive business forms and coaching tools. From our beginnings in 1996, Smoothie Factory has maintained a steadfast commitment to product quality. A majority of Smoothie Factory's premium smoothies are blended with real fruits only - without concentrates or purees - and we've translated that recipe into an unbeatable variety of delicious products.